If you're asking yourself, "Princess Who? and Count What?" right now, well, I don't blame you. So we'll start with a little genealogy, just in case these kids aren't on your royal radar. 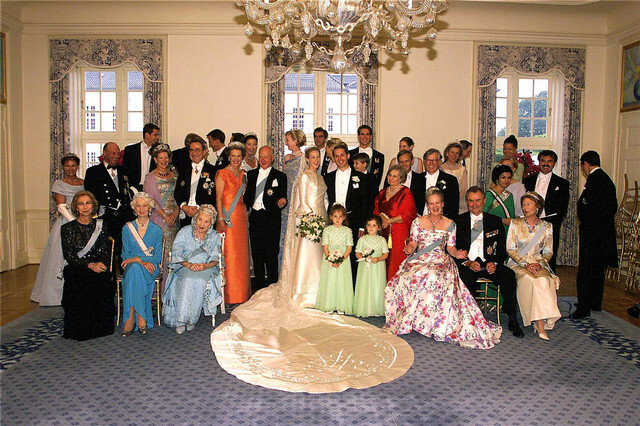 Jefferson is a German noble, and Alexandra is a member of the Danish royal family (and a German royal/noble, I suppose). 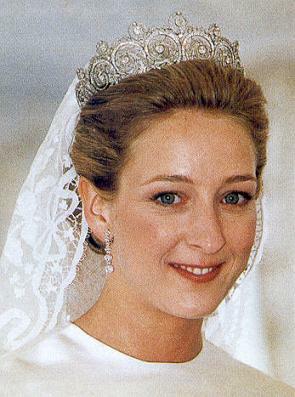 Princess Alexandra is the daughter of Princess Benedikte of Denmark and Prince Richard of Sayn-Wittgenstein-Berleburg (which was once a county in Germany, and is still a Princely house of which Richard is the head). This makes Alexandra the niece of both the Queen of Denmark and the Queen of Greece, and explains why the couple were married in truly royal fashion at the Danish royal family's summer home. 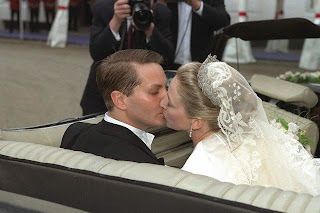 This wedding is of particular interest to us this week because Alexandra's sister Nathalie marries on Saturday. 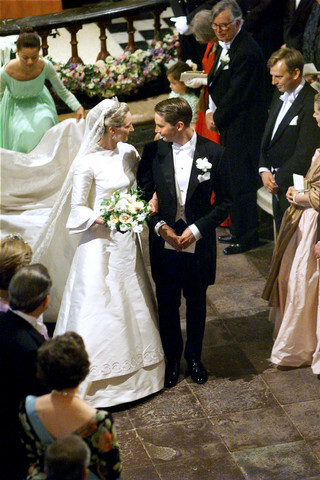 Today's topic is the gown, and we'll chat about the rest of the wedding on Friday. 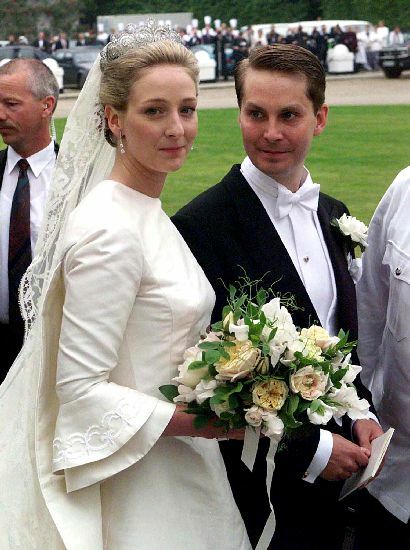 For her wedding gown, Alexandra called upon Danish designer Jørgen Bender. 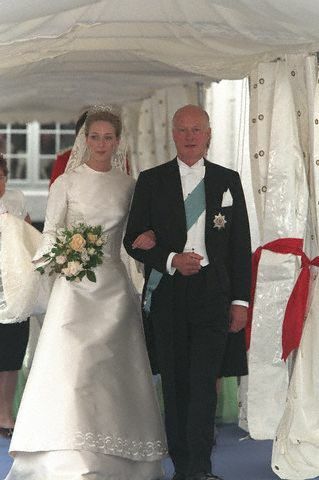 This was a man with a serious history of royal wedding gowns: he dressed mother of the bride Princess Benedikte for her wedding as well as both her sisters, Queen Margrethe and Queen Anne-Marie, for their weddings. 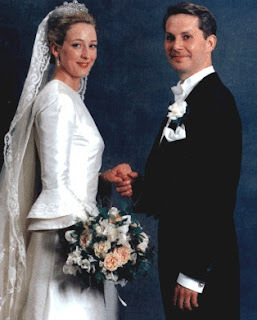 He also designed a wedding gown for another Princess Alexandra: Alexandra Manley, the first wife of Prince Joachim of Denmark. The swirl motif seems to echo the bride's tiara. Like all female descendants of Queen Ingrid of Denmark (genealogy check: Queen Ingrid was Alexandra's grandmother), Alexandra wore the Khedive of Egypt Cartier Tiara, which now belongs to Queen Anne-Marie. That tiara anchored another piece of tradition: the veil. 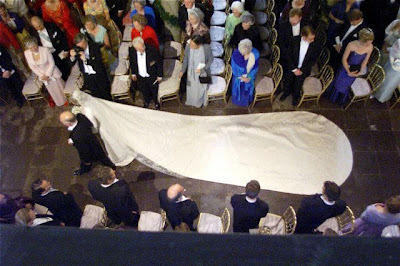 This antique Irish lace veil was originally a gift to Queen Ingrid's mother Crown Princess Margaret of Sweden. Margaret and Ingrid both wore it, as did Queen Margrethe, Princess Benedikte, Queen Anne-Marie, Princess Alexia, and Crown Princess Mary. I like the dress, and I think it suits this sweet young bride. That said, I just can't handle this kind of extra high, extra simple neckline on wedding gowns. I mean, it's not a t-shirt. What say you?